The Barranco Wall on Mt Kilimanjaro forms part of your early morning exercise on day 4 for climbers on the Machame, Shira, Umbwe and Lemosho Route. The Barranco Wall looks a lot more ominous than it actually is. You need no technical climbing skills to be able to scale the Barranco wall. 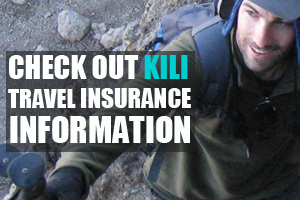 Most trekkers on Kilimanjaro, excluding those on the Maragu Route, Northern Circuit and Rongai Route, need to contend with the Barranco Wall. 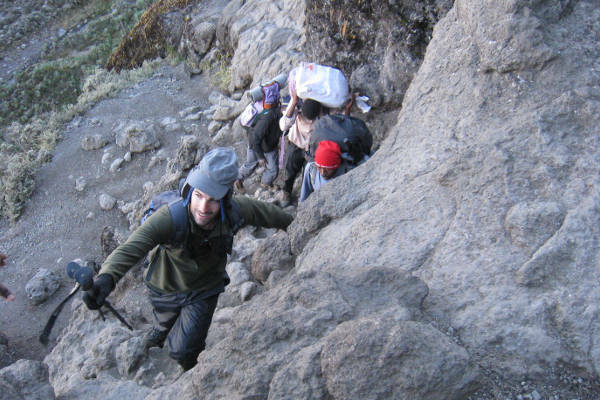 The climb is often called the Barranco Breakfast Wall as it is the first thing that you need to do on day four of your trek. The Barranco Wall elevation is 257 meters – it seems higher but it is not! The trick is to go slowly and make sure of each footing you take. Be deliberate and use all four limbs to scramble up the wall. It is best not to use your trekking poles for this part of your hike as they can often get in your way as you maneuver your way up the Barranco Wall. The climb up the Barranco wall takes between 1-2 hours – depending on your fitness level. At the top of the Barranco Wall the trail continues to Karanga Camp which sits in the Karanga Valley. Here you will finally get a chance to rest and enjoy some lunch. Some people sleep at Karanga Camp and only carry on to the next camp, Barafu, on day five. If you stop for the night at Karanga you are on a seven day route. If you are on a six day route, you will still have a three hour climb ahead of you to base camp Barafu. It is therefore important not to expend all your energy on scaling the Barranco Wall and remain cognizant that you still have a lot more trekking ahead of you. 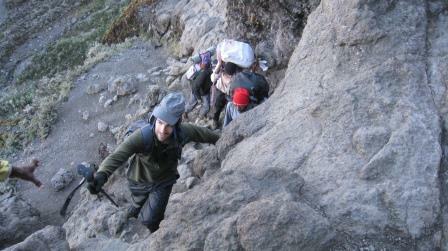 Trekkers on the six day route typically get to Barafu around mid afternoon. You will be served something to eat and then it is important to get some shut-eye as you will be woken at ~12pm to start your ascent for the summit. 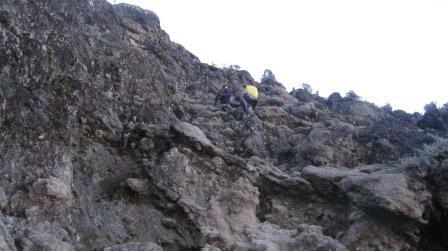 Scrambling up Barranco Wall. Have a look at the porters in the background with 20kg packs on their head, no hands and a 40% slope! 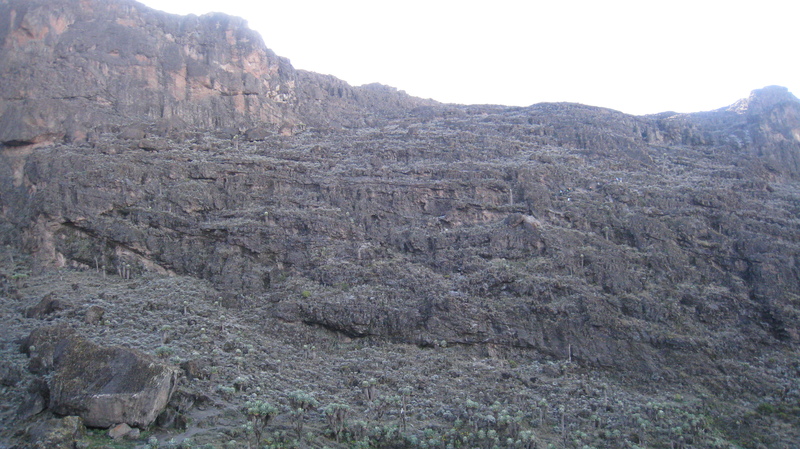 Here is a picture from the lower stretch of the Barranco Wall. It looks steeper than what it actually is! 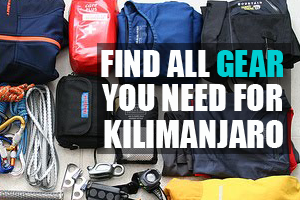 See here for a complete Kilimanjaro gear and kit packing list. I have a very fit and agile 12 year old daughter. She has done many hikes some exceeding 10 hours in one day. Would the Barranco wall pose any problems. Hi Michael, the Barranco wall shouldn’t pose a problem for your daughter. It is just a scramble. Make sure to go slowly and be sure of your footing throughout but I suspect if she has hiked a lot before then she wouldn’t have done similar types of scramble ascents. Best of luck! 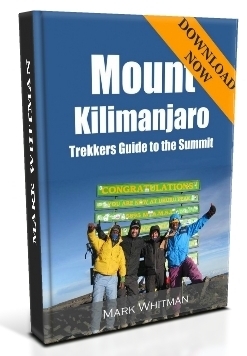 Hi, where can I find a list of groups or people whom summit Kilimanjaro since October 1st 2016 (5/10/2016)? Hi there, I would like to hike Kilimanjaro in September this year with my friend, who has lost his left arm in a car accident. Can he still do the climb especially the Barranco wall? And which route would be the easiest for him? He is otherwise in fantastic shape. Hi Sonya, It is totally possible to climb Kilimanjaro with just one arm. The Barranco Wall on the southern routes will pose a bit of a challenge but with support from the guides he should be able to get up and over it. Otherwise you could look at the Rongai route as an alternative. Either way I’m sure with the right support and preparation, your friend could make it!